For this project I used an Arduino Uno, breadboard, 2x 220Ω resistors (red, red, brown, gold), a red LED, a green LED, and wire attached to ground, and 2 wires connected to digital pins (12 and 13). I added the following code and flashed it to the Arduino Uno. 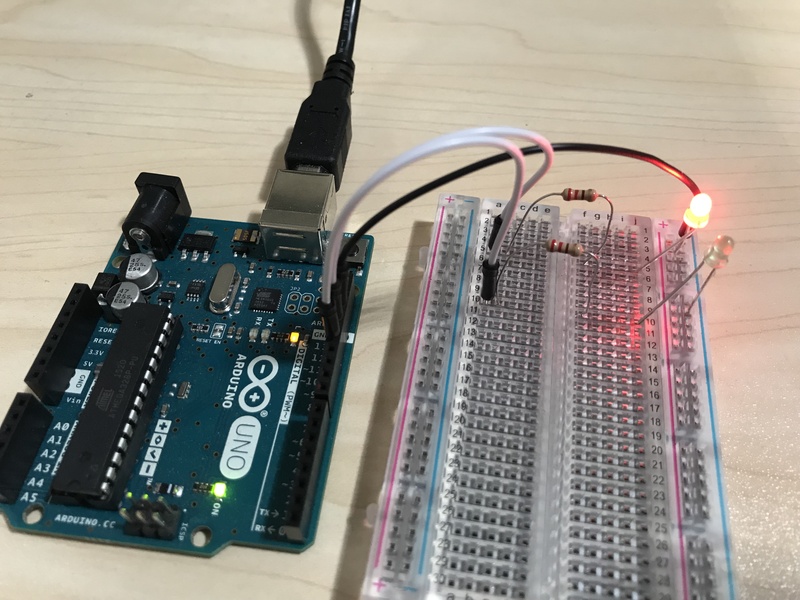 It initializes the LED pins, reads from the serial connection, and sets the LEDs to on/off based on the bytes received from the USB connection. I then added a Python script that uses boto3 (AWS SDK for Python) to check if a cluster is running that matches my name or tags. It then writes 1 or 0 to the (USB) serial connection based on the response and loops with a delay. I turned on the Arduino Uno and executed python emr_status.py from my Mac to start the process. If I have an EMR cluster running, it lights the green LED. Else, the red LED is lit. Super helpful.